Connecting on a personal level is an important part of sharing ideas. Here are some details about me and my projects along with my friends who instill in me the dedication that is necessary to keep me motivated. My Mother, Sheema Farah- has a great appreciation for art and helps me with making and designing the crafts and also with taking down the orders from friends, family, and realtives for the fund raiser. Mrs. Debbie Ballard-works at M.D. Anderson at the donation department and helps me with directing the money towards cancer research thus saving me from the trouble of going there in person to submit the money. My fundraising is directly directed towards prevention and not just treatment because my mission is eradication of cancer. Myself-Rama Bushra Imad-the mastermind behind this dream. I work on making of the brochures, crafts, and selling. My friends and family make me feel so special and worthwhile as I avail the opportunity to do something that I really want to do and no matter how tiny my efforts are but they make me feel so big of myself and so proud of my actions, my dreams, my visions, and my understanding, by becomming a part of my fund-raiser! Thank you all! While touring my Dream Place, M.D. Anderson! Mrs. Debbie Ballard, Me, and my mom Ms.Sheema. Knowing Them All At The Personal Level. Mrs. Ballard works at the M.D. Anderson. She had been in research for sometime. I know my mom, Ms. Sheema Farah, as a gifted artist, a very talented Mother, and my best friend. She is a nature lover. I, Rama B. Imad, love Math, Music, Mystery, Science, Art, reading, swimming, and ofcourse children. I love challenges in life and want to make a difference, no matter how small it might be. I take life as a precious gift and treasure it with all my heart. Mrs. Glenn was my writing teacher in 3rd Grade! My Other Projects At School And Outside OF School! 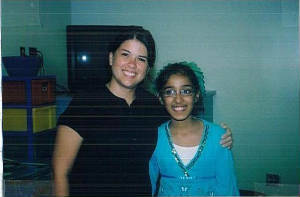 My awesome teacher Miss Hartman and Me. I have a collection of story books. After reading them I donate them to the children in different hospitals with my moms and her freinds gracious help. This year I donated them to the children at the UTMB in Galvaston County. I donated 100 story books in all. Most were mine but some were also handed over to me by my friends for give away! I enjoyed taking on that responsibility and felt good for doing my part in giving back to the community that has given me so much! I am also working on Fund Raising Project with my awesome Girl Scout Troop # 7130 under Mrs. Susan Dechellis and Mrs. Teresa Ludovice's leadership. Besides, every girl in the troop is suppose to work and earn 3$ each and then make a contribution towards 150$ that will be donated in the planning of building a place for the Girl Scouts! - By the grace of GOD, this year I am the highest cookie seller in the entire Service Area that is I am the highest seller among 40 troops from the county! Another reason why I love Girl scout is that my best friends Danielle, Rachel, Celeste and Elise are also there. They are all so precious to me! I also babysit friends dogs for free. I enjoy doing it and I always make sure to clean up after them because I am a strong environmentalist. Puzzlers Puzzles. That is creating my own puzzles of every kind and every type that you can think of with MIss Hartman. First student's monthly News-letter ever in the history of our school is being started,written, edited, and published by me and my friend Rachel from Miss Hartman's 4th grade class under our teacher, Miss Hartman's guidance and supervision. A news-letter for the students, started by the students! Power Point on Weather,Explorers, Math explorer, and Animals. 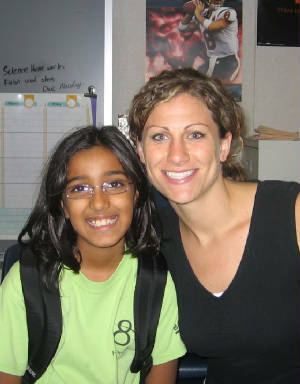 This year under my teacher Miss Hartman's guidance I represented my school Falcon Pass at the Earth Science 2006 Contest and won 1st place for my school and 300$ for myself, all over America, by the grace of GOD! I also represented my school at the Environmental Contest and won " Award Of Merit" at the State Level again under Miss Hartman's guidance for both writing and drawing entries in 3rd grade. Last year i.e. 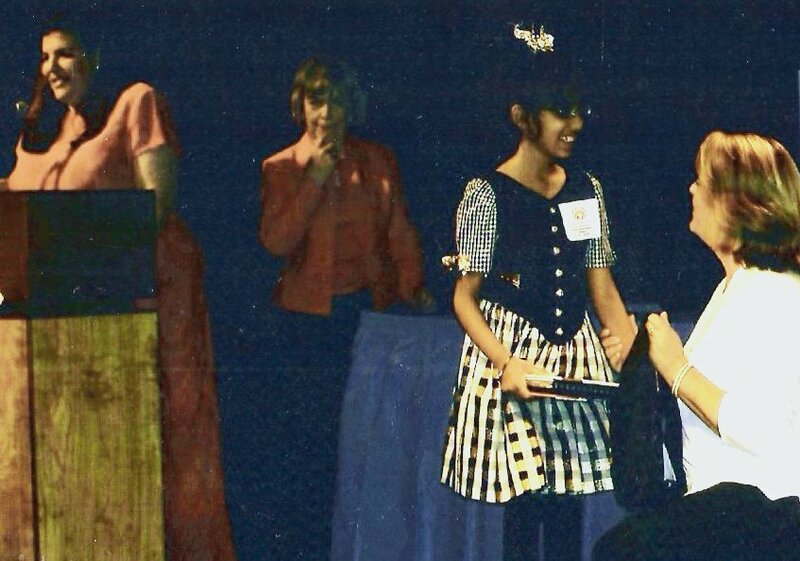 in 3rd Grade when Miss Glenn and Miss Hartman were my teachers,I represented my school at the Channel 8 PBS Story writing contest and came first twice, for two consecutive years-2005 and 2006. 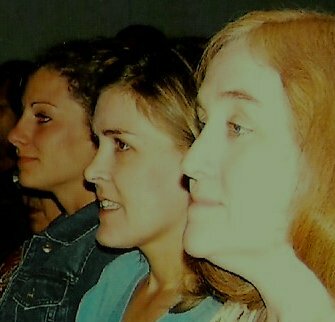 My Story that won in the year 2005 PBS Channel 8 Contest was later used by my counsellor at Falcon Pass Elementary School, Mrs. Beth Figg, for counselling those children at our school who come from broken homes. I felt happy that I was able to help other children at my school in some way! Mrs. Figg was my counsellor too for sometime. She is a great person and a good friend. I miss her! I also get to spend time with our new counsellor Miss Beth Johnson every now and then. She makes me feel special in a different way. I loved it, when she visited me on Christmas. She is very soft and understanding about a lot of things! I am begining to like her. My very dear friend Rachel and I won first place in Button Contest for 4th grade. I have won in this contest now for 3 years in a row by the grace of GOD! 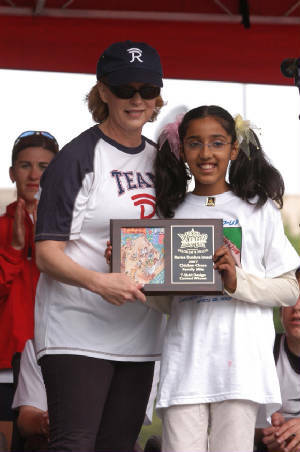 I represented my school at the CCISD Nutrition Contest and won first place for my school in the entire district, under my teacher Miss Hartman's guidance.I won a BIKE and alot of goodies in this contest. This year again I won in the Environmental Contest and made it to the District level with my all 3 entries ie drawing, photography and writing. I won First place, blue ribbon for my entry in DOG Art contest 2007 at Reliant stadium out of 700 entries from various schools in Houston area! 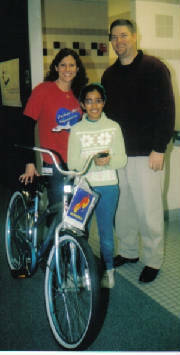 I was the Texas winner of Nicholas Green Distinguished Student Award 2007 in acedemics! First ever won by our school! I won 2 Scholarships this year by the grace of GOD and got selected into a Science and an Art program. I am so grateful to GOD and my teachers who have coached me. I Also won First place from the entire state of Tx. in the Governor's Health and Fitness Contest. Meeting the Governor of Texas was a dream come true for me. Both my mom and I along with my teacher were invited to Austin and were put in a very nice hotel on state's expense. Ms. Teresa, Ms. Penny, Ms. Christina,Mr. Vinceton and Miss Marty were the people who showed us around and also entertained us by keeping us busy with all the activities there. They were very sweet and kind! The contest was open to everyone from the age of Kindergarden all the way to the High School children and I was the lucky one to win this title for my school. The Award was given by Mr. Governor and the First Lady ie his wife! I won 2nd place at the Hobby Airport Contest and recieved award and certificate from Tx. Mayor Mr. Bill White. Houston Chronicle covered the news and channel 55 sat for an interview with me which will be aired on T.V. pretty soon! I have been nominated by Mrs. Raines for the Young National Scholars Program, which is a very prestigious program. Mrs. Raines is my Language teacher. The secret behind our good reading and writing skills is that Mrs. Raines make us work our behinds off! She is our language teacher. Art Club at FPE with Mrs. Clement,our Art teacher. -My Art Work along with some of the other fellow student's work from our entire school was selected to be diplayed at the ARTS ALLIANCE CENTRE. This Art contest was being held in connection with RODEO. I won second place there and felt happy to be among the lucky ones. -I also represented my school at inauguration of the Texas Children's Hospital's Clear Lake Branch, The Clear Lake Health Center's grand opening under Mrs, Clement's guidnace. My name, my school's name and my teacher Mrs. Ruthi Clement's name in mentioned on one of the hospital's wall along with my Art Work, that was selected from the entire school. The hospital also honoured all the young artists of the CCISD and I was proud to represent my school there. This Health Center is a branch of Texas Children's Hospital and it's President/CEO Mr.Mark Wallace did the grand inauguration of the Clinic. He was very kind to stop-by and shake hands with me. He asked me about my school, my grade, my teacher and also what I want to be when I grow up. I wish I could say "may be a CEO someday, somewhere." ( Just joking). It's a pretty neat hospital so whenever you visit it please don't forget to check out my Art-work along with our school and Mrs. Clement's name there on one of it's walls. They have an awesome children friendly staff and everyone talked to me. It was a fun experence! - I am also representing my school at the Region 4 Art Exhibition for my writing and drawing entry under my Art teacher's guidance! - My Art-work also made it's way to the Arts Alliance once again for Display for the Youth Art festival week! Piano,Choir, and grade wise musical plays presented at FPE under Mrs. Meyer,our music teacher's guidance! Our Choir sang at the Aeros game and our Principal Dr. Stevens hit the puck to start the game. Woohoo! -Mrs Meyers identified and appreciated my music talent. She arranged completely free private music lessons for me! 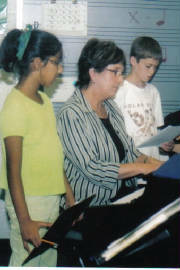 I like my new piano teacher whom Mrs. Meyer's chose specially for me! Mrs. Meyers is a great teacher and we love her! 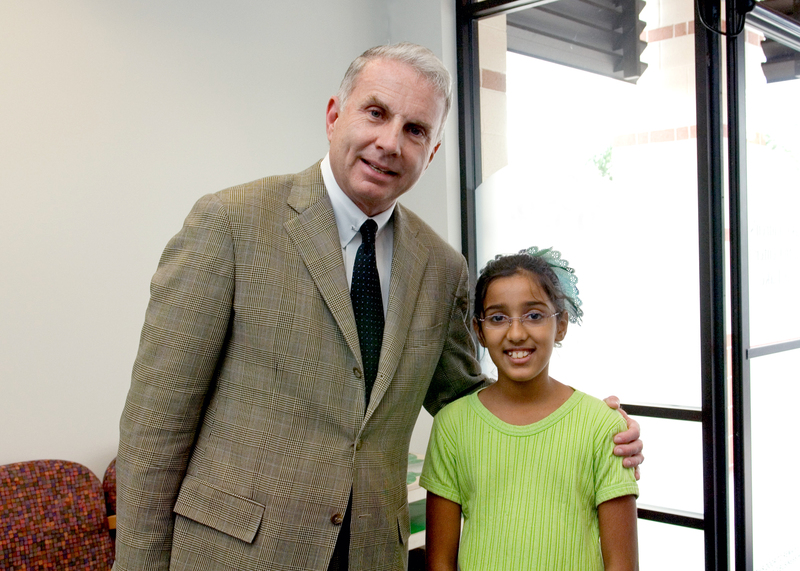 We wish her speedy recovery and look forward to seeing her back, next school year! Choir is no more the same any more! ARP is a great fun reading program for all the children at FPE. Mrs.Phyllis Lankford, our Librarian reads us fun stories and guides us on our research assignments. Right now I am the TOP ARP Reader in my entire school. I feel happy for reaching this goal that I had set for myself at the begining of this school year! -I am attending Robotics in my Alpha mini courses and having a blast over there with my other friends from our school as well as other schools too! Recycling Committee, under the guidance of Miss Westbrook, our technology teacher and Mrs. D. Selmarten. On October 18th we all at Falcon Pass Elementary School showed our support for our fight against breast cancer by wearing pink in the memory of Miss Westbrooks sister Kerri who died of breast cancer in May 2006. 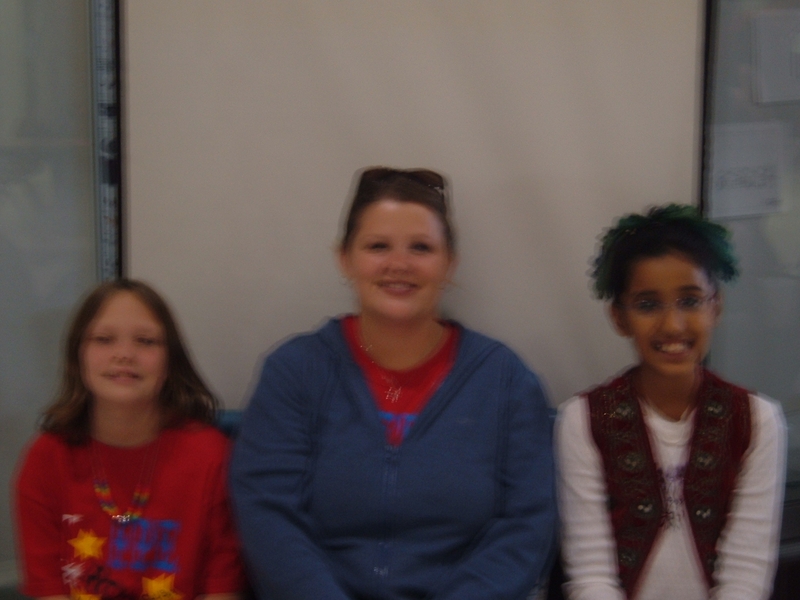 I also attend Lego league after school program at my school with one of the 4th grade teacher, Miss Mc Gowen. She is very cool and I am really having a great time learning something completely new, that I never ever tried before. My school has also arranged Basket Ball one on one lessons for me . I am having a great time learning this fun game and am getting better at it by GOD's help. -I have also been learning gymnastics by taking lessons at a local gym! And at school during the recess time, I practise and learn new gymnastic routine with two of my very good friends as well! Now I can do the Mill Circle! I took gymnastic lessons at a local gym for almost 4 years! I have been selected in the DUKE TIP PROGRAM which is a very prestigious program! I owe it to my teachers and my school who taught me so well! Our Principal Dr. Stevens invited few children from the entire school( 7 to be precise ) to have lunch with Schools Superintendant, Dr.Sandra Mossman. I was among the lucky ones. We all had fun that afternoon with two Doctors in the same room! Dr. Stevens has a very good sense of humor and the food was YUM! I also attend programs at the Children's section of the Freeman Library with the awesome librarians there:- Miss Holly, Miss Penny, Miss Daleyda, Miss Elizabeth, Miss Shanon, Mr. Chriss, Mr. Stephen, Miss Laura, Miss Christina, Miss Gill, Miss Chris, Miss Leigh, and Miss Tanega! I know them all and most of them now remember me as a little girl who had been regularly visiting this new Library since the time of it's birth. Infact this is one Library besides my school Library, I know of, that I watched being born and that I am older to!! Jill Hartman, Debbie ballard, Holly Koile Head Librarian of Children's Section at Freeman Library. Ms. Karen Vine from PBS channel 8 is a fun person.